Well, that was quite a weekend. 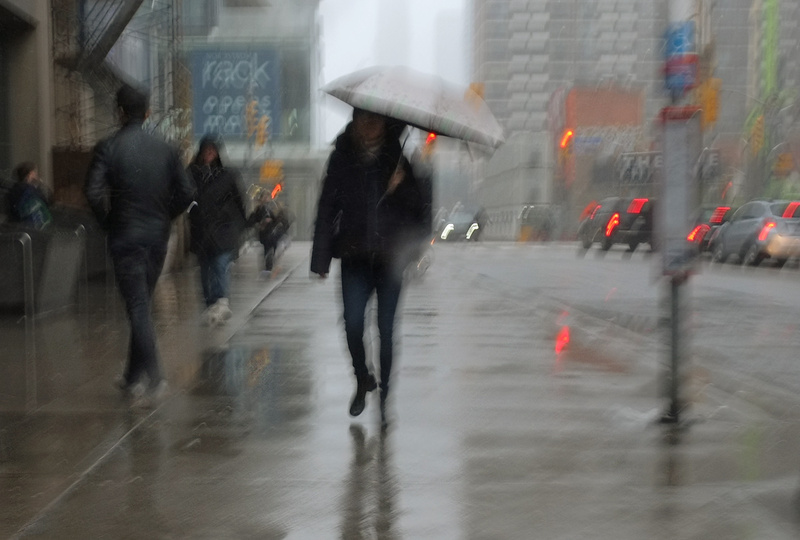 An April winter storm with snow, sleet, ice pellets, freezing rain, and even some just plain rain. 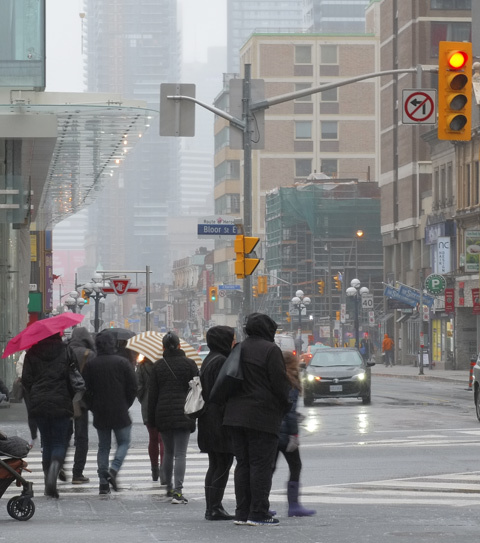 The streets were icy and the sidewalks were slushy and wet. Chunks of ice have fallen off roofs, tree branches have broken off with the weight of the ice that formed on them. And then there was the wind that blew hard. Of course I went out! below: Dressed in our April finery. Black parkas. below: There is a small, but interesting, exhibit at the Toronto Reference Library at Yonge and Asquith that I wanted to see. 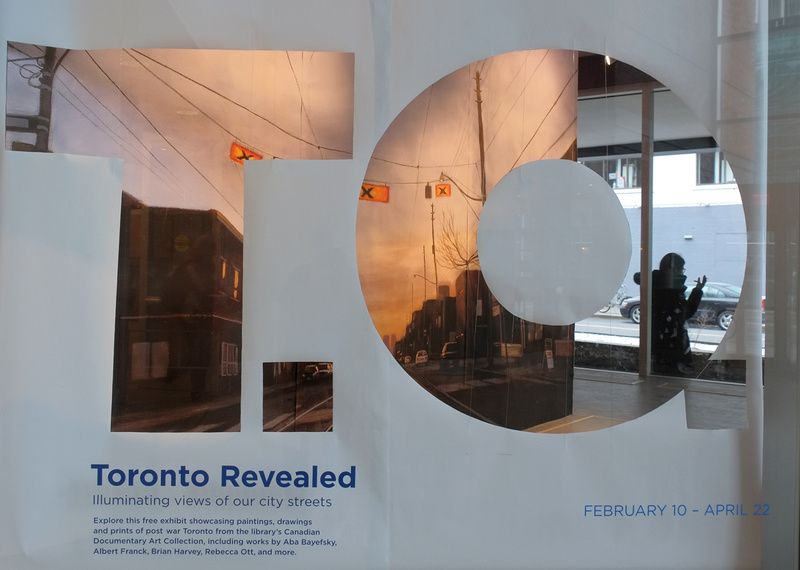 It’s called ‘Toronto Revealed’ and it’s in the TD Gallery on the main floor. 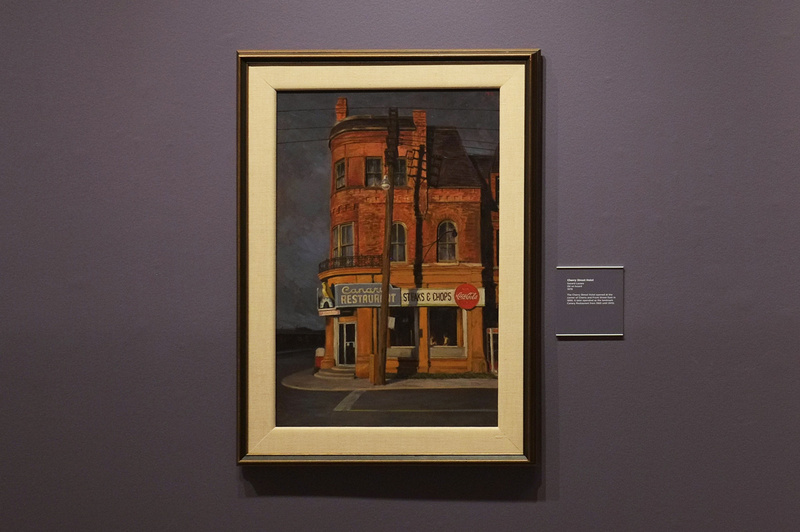 It features drawings and paintings of Toronto’s past. below: One of the paintings in the exhibit is this one, ‘Cherry Street Hotel’ by Gerard Lazare (1978). The Cherry Street Hotel was built in 1890 at the corner of Cherry and Front Streets. It later became the Canary Restaurant (1965-2010). The building is still there but it stands empty. 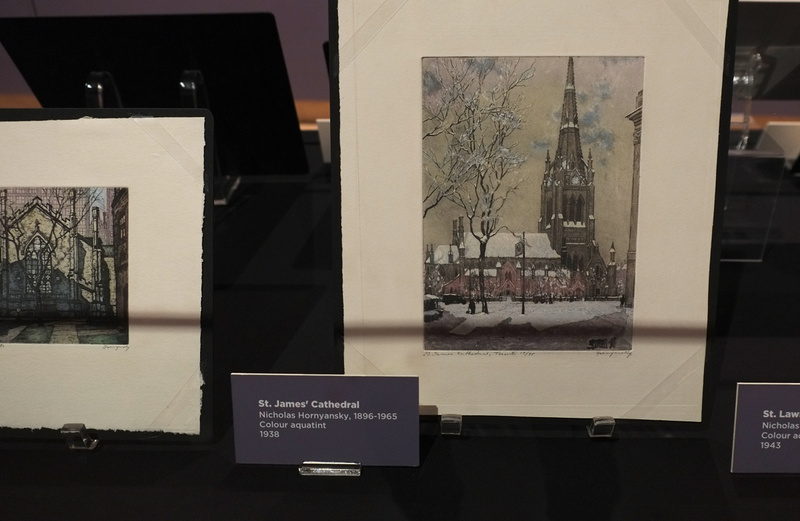 below: There was a display of small artworks by Nicholas Hornyansky (1896-1965), including this one of St. James Cathedral (1938). Hornyansky was born in Hungary and immigrated to Canada in 1929. He is known for the etchings and aquatints (another print making technique) that he did of Toronto buildings and landscapes. 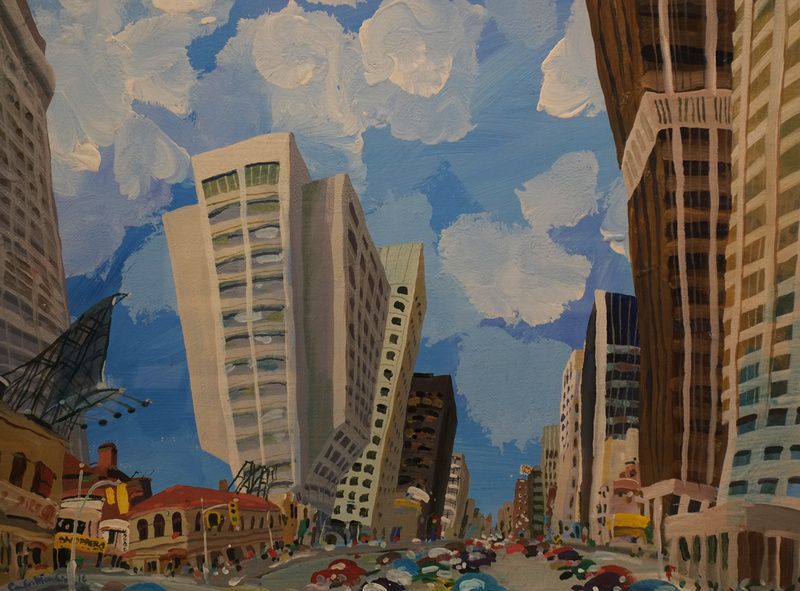 below: Most of the paintings were very realistic (documentary) except this one – a wacky view of Bloor Street looking west from Yonge towards Bay by Carlos Marchiori, painted in acrylic in 1976. Even then, it is fairly true to reality. 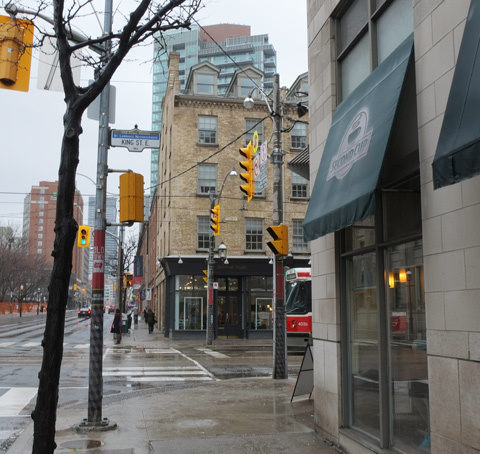 The darker tower on the right is on the NW corner of Bloor and Yonge. Stollerys store (the low building on the SW corner) is long gone. While I was at the library, I wandered around and took a few pictures of its vast open spaces. It was warm and dry! 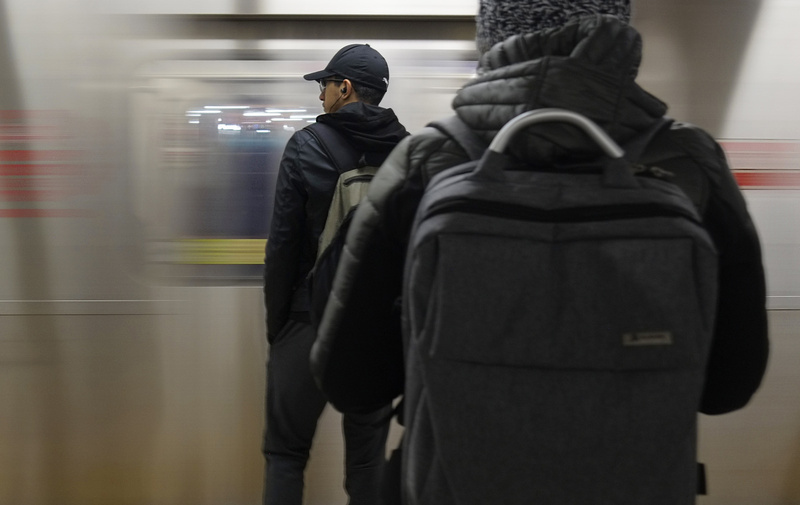 I was expecting to be told to put my camera away, but no one seemed to care. below: Most were too busy working to notice. 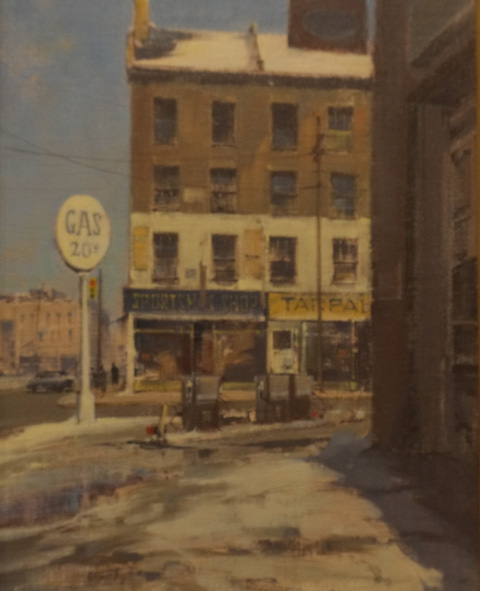 below: One more picture from the ‘Toronto Revealed’ exhibit is this painting of the intersection of King and Jarvis by Vernon Mould. It was painted in 1979. Was gas really 20 cents a gallon in 1979? No! That was the year that prices went metric and a litre of gas was 20 cents. I came back to this picture because I chose to chase down that intersection to see what it looks like today. below: Et voici, same intersection, approximately the same angle. There is now a building (with a Second Cup on the ground floor) where Mould would have stood. By the looks of it, the three storey brick building on the NE corner has been fixed up since 1979. So glad to see that it hasn’t been replaced by a glass condo tower! 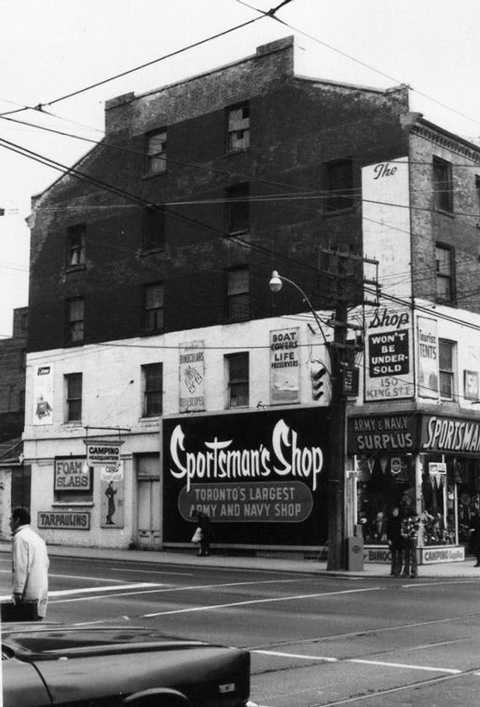 below: I wanted to find out more about the building, so I googled Sportsman’s Shop and I found a wonderful old picture of it from the 1970’s, obviously taken before it was renovated. Apparently, it was fixed up in the early 1980s. 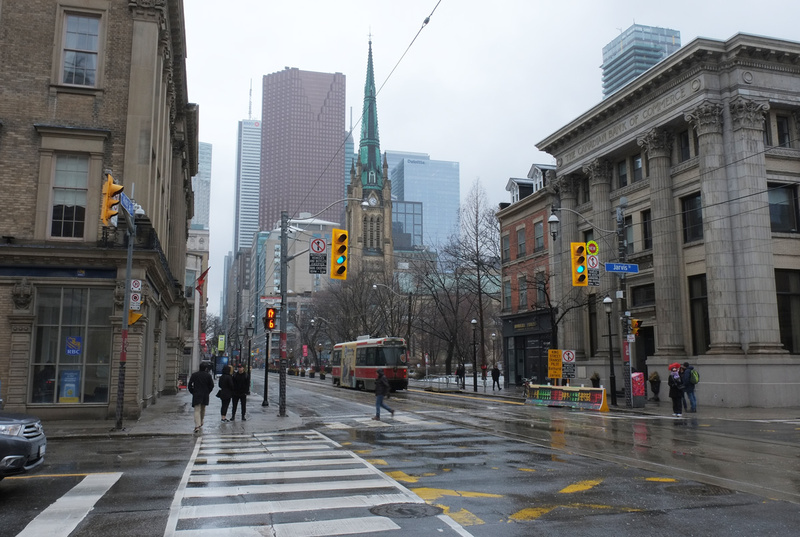 below: The next photo was taken as I stood on the same corner of King and Jarvis, but pointing my camera in different direction – looking west on King towards St. James Cathedral. This is the eastern limit of the King Street streetcar project which is why the multicoloured barricades block part of the righthand westbound lane. below: These women are waiting in the wrong place. 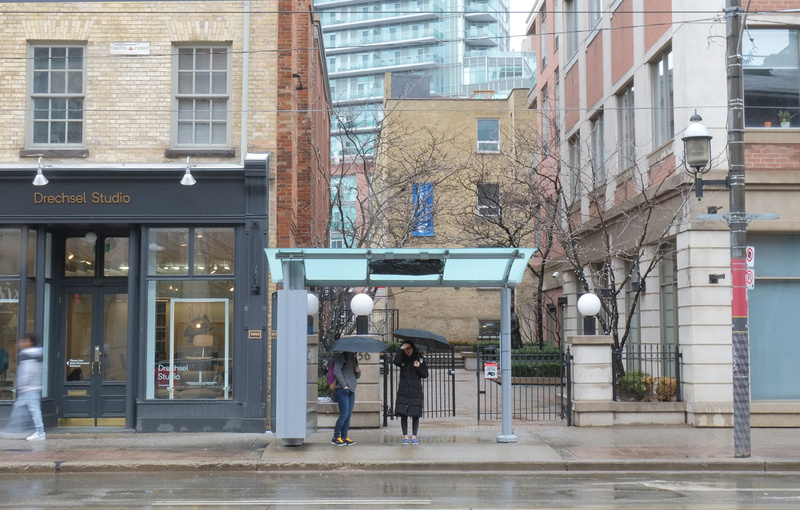 Although the city changed the location of the streetcar stops along King Street, the bus shelters haven’t been moved yet. 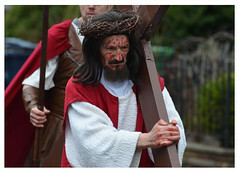 At least they were (sort of) out of the rain. They soon realized their mistake. 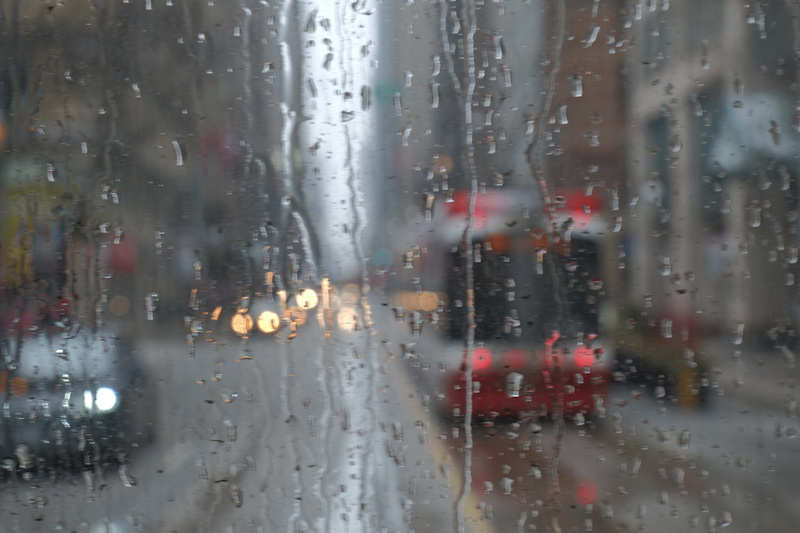 below: Looking back, the prerequisite photo of a TTC streetcar through a rainy day window. It’s always better to end a blog post on a happy note, right? It may be a dream (I hope not!) but spring can’t be too far away. April showers bring May flowers, right? On my second warm up stop I saw this cheerful, hopeful drawing tacked to a wall. 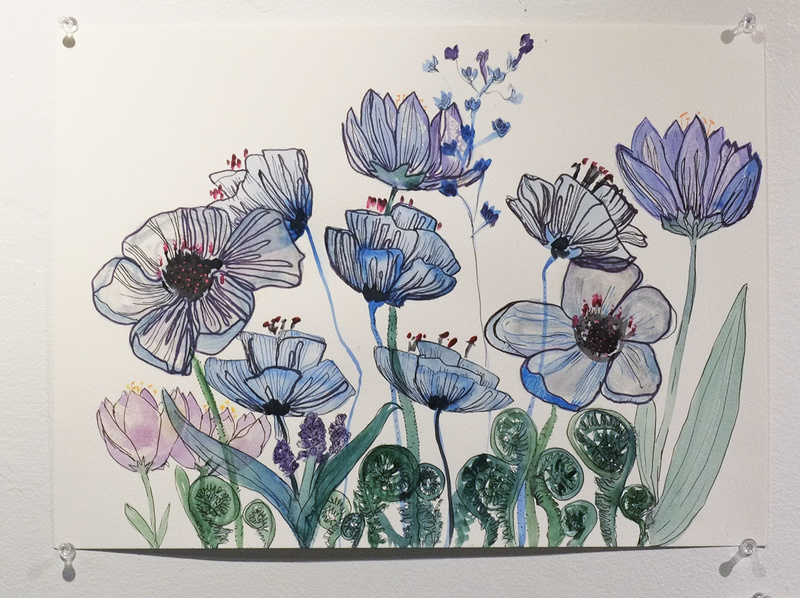 It was one of many on the wall, all the work of Maihyet Burton. 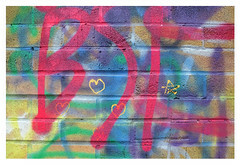 They were at the Artscape building at the Distillery District. Don’t put away your boots and hats yet! 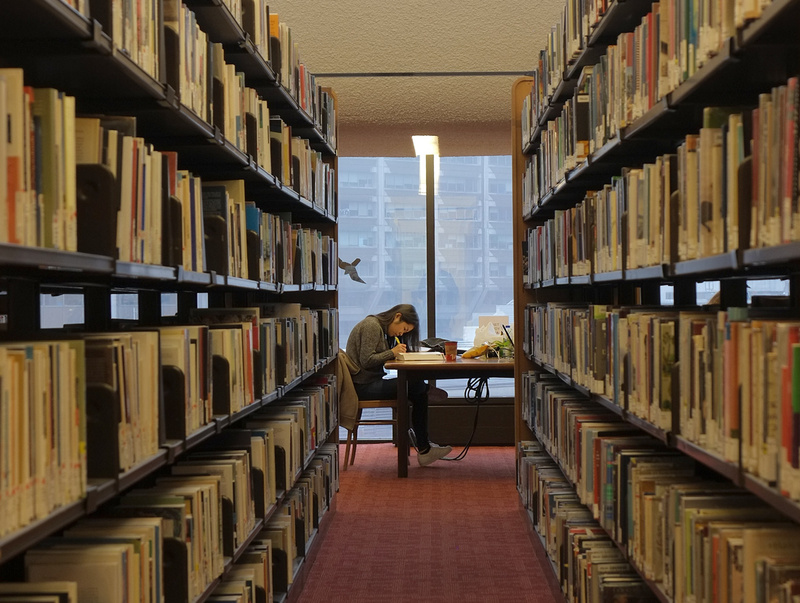 I love both library shots the most. Beautiful! 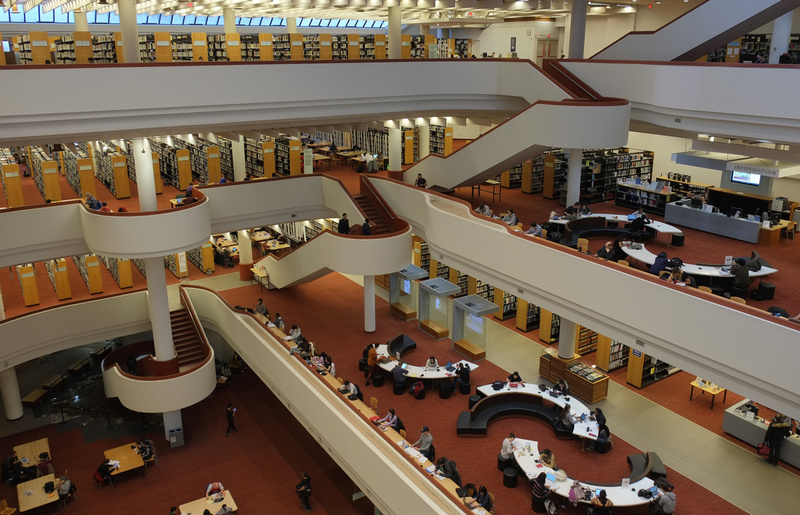 I agree with Manja – I like the library shots. I have never been there. I know, I’m ashamed. Another vote for the library shots. I will have to visit that place the next time I’m in your city. You were a brave soul! I spent the weekend on the couch! But – I am venturing out today. My friend works at the Diocese office at St. James – you’ll have to go back in a couple of months when the garden is finally in bloom – it’s lovely. I heartily recommend the Reference Library – their exhibits are wonderful and the staff is always helpful. Many of the high profile authors in their Speaker’s series do their talks there – but book a ticket first thing and get in line early as seats are first come – first served. Did you visit the Sherlock Holmes exhibit while you were there? It’s wonderful. bruno smoky on Croft St.